The Emergency Communications Center at the Polk County Sheriff’s Office celebrates PSTW every year and this year is no different. 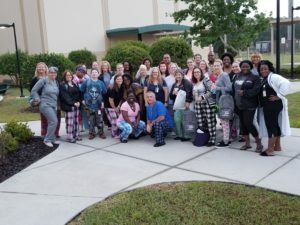 The enclosed photo is the kickoff day for the week and is Charlie shift celebrating with pajama day and breakfast made for them. We have theme days and lunch planned for each shift throughout the week. Charlie shift supervision also purchased backpacks for every shift member filled with goodies. We also have drawings planned throughout the week. It will be a great week!